And my favourite month of the year, October!! is around the corner literally… What is it going to bring me this year?, mmm… I don’t really know, what I’m positive about is that for sure a hangover since is my birthday on the 15th! haha… Let’s hope for health, work and happiness. This year I think it might be hard to celebrate as I love since I’m far from home and not all my people will be with me. 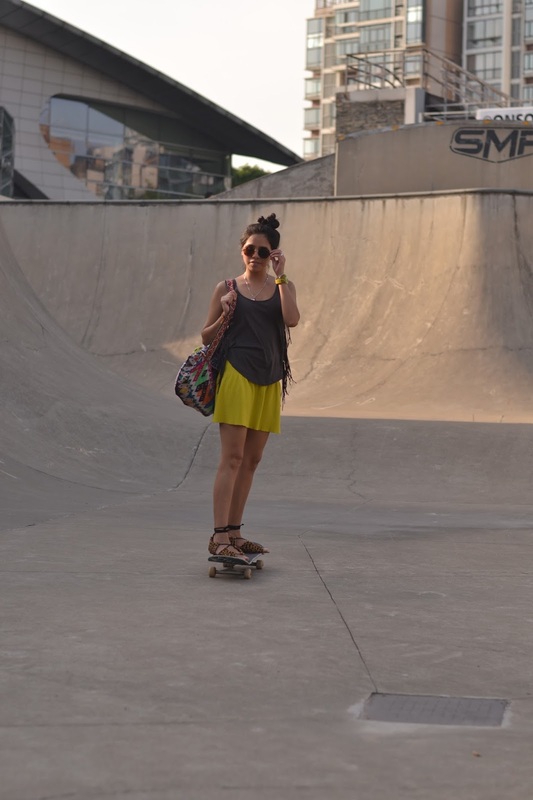 This time I come with a new outfit post from the Shanghai skatepark SMP in Yangpu at the north of the city. It is very close to our home here, and Giotto goes often, If you practice skateboarding it is a good spot located at the end of metro line 10 to Xinjiangwancheng, kind of old and a bit rusty in some ramps, yet very fun. It was a sunny day, the last ones very warm before the real cold starts, so I went with hubby. I am not a skater but enjoy a lot watching it, I ride a board without breaking something, but no tricks at all, I’m so afraid of hurting myself very bad, after watching hours of skate videos and see the fails I got traumatised enough. But I can cruise around and that is why when I came back from Amsterdam to Shanghai my hubby surprised me with a cruiser!!! I didn’t expect it! such a good and different present! Thanks amore. Hola a todos!! y mi mes favorito del año, Octubre está a la vuelta de la esquina literalmente… ¿Qué va a traerme este año?, mmm… no lo sé, de lo que estoy segura es que con seguridad una resaca ya que es mi cumpleaños el día 15! jaja… Esperemos por salud, trabajo y felicidad. Este año creo que será difícil para celebrar como me encanta ya que estoy lejos de casa y no toda mi gente está conmigo. Esta vez vengo con un post nuevo desde SMP skatepark Shanghai en Yangpu al norte de la ciudad. Es muy cerca de nuestra casa aquí, y Giotto va muy a menudo, Si practicas skateboarding es un buen spot situado al final de la línea de metro 10 hacia Xinjiangwancheng, un poco viejo y un poco oxidado en algunas rampas, pero muy divertido. Era un día soleado, los últimos muy caliente antes de que arranque el frío de verdad, así que me fui con mi esposo. Yo no soy un patinadora, pero disfruto mucho de verlo, me paseo con la tabla sin romperme algo, pero no hago trucos para nada, tengo tanto miedo de hacerme daño, después de ver horas de vídeos de skate y ver las caídas estoy traumatizada lo suficiente. Pero puede tomar pasearme alrededor y es por eso que cuando regresé de Amsterdam a Shanghai mi esposo me sorprendió con un cruiser!!! No me lo esperaba! un regalo tan lindo y diferente! Gracias amore.